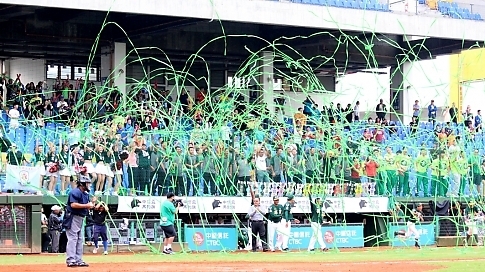 2015 MAZDA "Taiwan day high school baseball exchange game" tomorrow (25th) will debut, from Japan of Ehime Prefecture, and Yamagata and Fukui 3 support Star team today (24th) grasp time to Xinzhuang baseball field do last adjustment, on will and Taiwan this year black Leopard flag Qian 3 name of high Yuan business, and Pingchen high school and Taniho home business played, Japan 3 team head coach coincide said each field game are will best, towards best results. Fukui star team is to this year spring jiazi Park champion of Nathan he gas than University for subject, tomorrow opener will d Shang black Leopard flag champion Kao Yuan business, Fukui head coach Dong Zheping said, Star team has 10 bit Nathan He Qibi of players, also has playing had jiazi Park contest of experience, game will will best, "impression in the Taiwan players power is strong, but cannot so on lost off. Fukui star team captain forest in the Yong hui from Nathan he gas than University, high Shi on playing had jiazi Park, now is team Lord, Nathan he gas than can won this year spring jiazi Park champion, is team combat practice weight than other school more, forest in the Yong Hui Frank to said on garrison compared didn't confidence, but coach are will encourages he, this game also will good efforts. Journal of the Yamagata stars head coach Ivy Tatsuya says stars team in the Yamagata Prefecture is the first time for nearly 7 years, and strive to find the best lineup, the game gives the player more opportunities to compete, would let them play. Ehime star said team head coach Shigesawa and history, can come to Taiwan are happy, then a movie "KANO" release jianong Kondo taro is from Ehime prefecture's predecessor, General coach, due to the game you want to play stick players recently have worked very hard in practice. Game fairness, "Japanese high school baseball exchange game" stick game, but Japan baseball uses aluminum bars, three teams are in the official competition for the first time using a wooden stick, Dong Zheping admits that although players usually use a bamboo stick practice, but still worry about players not used to it. When it comes to the overall strength of the team, think Ehime prefecture as a whole than the Ming dynasty Garrison City, good. Chi Ivy Tatsuya pointed out that, owing to the nature was United, fielding to each location to practice very hard, to fight as a priority. Dong Zheping, said Fukui had 2, 3 Nathan He Qibi's main player, should be considered combat and garrison are good, high school players have experience playing koshien, Meiji Jingu Shrine won the second place of the General Assembly this year will show heart went all out to win. "Japanese high school baseball exchange game" from the 25th at the Hsinchuang baseball stadium to even the 3 day, 3 games on a daily basis, Valley home tomorrow morning to take the lead against Ehime-star team, Ping Cheng played high school in Yamagata-star team this afternoon, night on the opening day by Kao Yuan business on Fukui team, Japan kick off will also serve as guest star Yang Dai steel.